Remittance inflows swelled 7.3 percent to Rs679.73 billion in the first 11 months of the fiscal year 2017-18, despite a drop in departures of Nepali migrant workers, according to the latest Macroeconomic Report of Nepal Rastra Bank (NRB). The jump in the value of remittances has been attributed largely to a rising US dollar against the Nepali rupee. The report said that 342,426 individuals were given approval for foreign employment in the first 11 months (mid-August to mid-June) of this fiscal year, down 8.2 percent. Foreign employment statistics show that Malaysia topped the list of destination countries for migrant workers. A total of 104,149 people left for Malaysia in the first 11 months of this fiscal year, up 15.37 percent as compared to the same period last year. Similarly, Qatar emerged as the second most popular destination with 97,536 individual workers going to the oil-rich nation. However, the number of Nepalis going to Qatar dropped 18.57 percent during the review period. Departures to the UAE increased by 5.46 percent to 55,631 individuals. According to the data, the number of Nepali migrant workers going to Saudi Arabia declined sharply by 46.60 percent to 38,680 individuals. Foreign job market analysts said Saudi Arabia faced problems like oil price and other economic issues that led to many companies being shut down. There were also reports of migrant workers getting low wages and payment delays, which might have led to the decline in the number of Nepalis going there for jobs, they said. According to migration expert Arjun Kharel, the growth in remittance shows that more and more Nepalis working abroad have been sending their money through formal or banking channels. Besides, the growth can be attributed to an appreciation of the US dollar against the Nepali rupee, he said. “Remittance inflows have grown even though the number of Nepali workers seeking approval for foreign employment has been on a declining trend,” he said. “The impact of the drop in worker departures will not be visible immediately. However, it could be reflected in remittance inflows next year.” Nepal has seen a dip in migrant worker departures for two consecutive years. 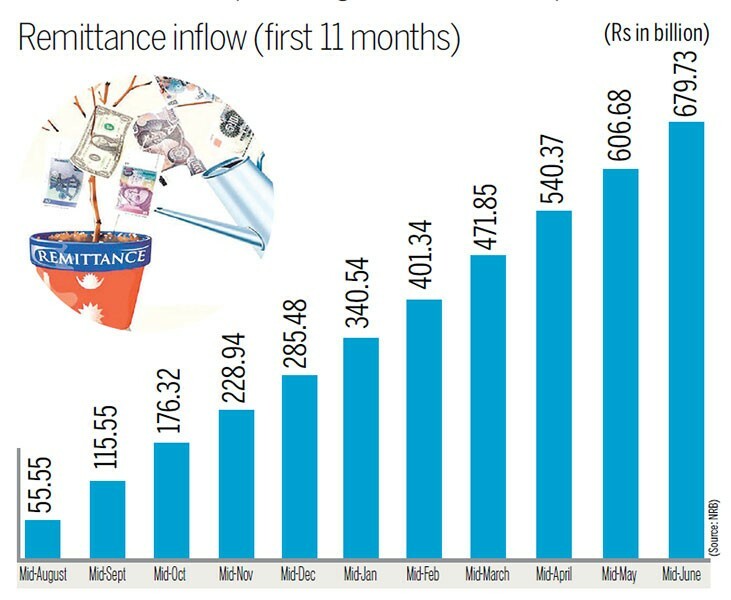 Remittance inflows began shrinking from mid-November. The trend continued till mid-January of the current fiscal year.